you must uncover the → problems and then → solve them. in the roots, i.e. in the value created for others. The stronger the roots, the healthier the tree, the tastier the fruits, and the more people would love to eat them. ‒ we help people, societies and economies grow. UNDOs have member countries, media attention, big buildings, donors, budgets and staff. than the websites of most intergovernmental organizations. the Asia-Pacific region. I used to contribute my drop to the sea of the developmental value created by UN ESCAP. 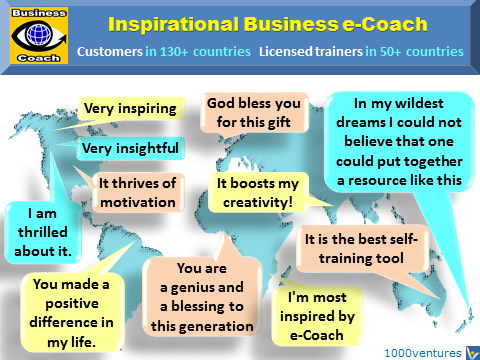 Then I invented an inspirational e-coach helping people and organizations grow faster. In 2004, I became a solo interpreneur. Today, more people visit my website than that of UN-ESCAP. I used to contribute a small drop to an ocean. Today, my drop is larger than that ocean. Bias towards procedures. Due to strict regulations, UNDOs are procedure-focused, not value-focused. Bias towards events. Due to the lack of strategic resources and capabilities. UNDOs are event-oriented, not result-oriented. They focus on organizing international gatherings and producing reports. due to lack of strategic resources and over-formalized procedures. to make any significant changes. Bias towards reports. In this over-organized environment, many employees having started their carrier as result-oriented persons grow gradually into report-oriented ones. Bias towards informing about events instead of creating value online. Imagine a courier service that focuses not on delivering goods, but on talking about how actively their people move around. That's what many development organizations do ‒ on their websites, they focus on providing information about the events they've organized. instead of creating greater value for website visitors. As a result, few people visit their websites. People don't want to know how you "move around" ‒ they want to you to help them satisfy their needs. Collecting unactionable recommendations. UNDOs often ask meeting participants to provide their recommendations without giving them any guidance. As a result, the participant create a "wish list" that is usually dominated by unrealistic requests for financial assistance UNDOs cannot provide.